ON THIS DATE (June 18, 1977) ... In a season of bickering and intramural fighting, it should not have come as a surprise to anyone. But another Yankee time bomb went off, and this one carried a shock wave strong enough to shake the foundations of the defending American League champions. That a sellout crowd at Fenway Park and a national television audience happened to have the whole show in clear view probably had little bearing on the near-brawl between Mgr. Billy Martin and his star right fielder Reggie Jackson. But it didn’t fail to lessen the impact. Who’d ever have thought that a turning point in the torrid division race could be a seemingly innocent half-swing double by Jim Rice in the bottom of the sixth inning? Reggie Jackson, the $2.9 million dollar slugger, had to run a long way from deep right field to get to the ball that blooped about 100 feet between second baseman Willie Randolph and Jackson. Martin, apparently surmising that it was a lack of hustle by Jackson that allowed Rice to continue to second on the hit, paid him the ultimate indignity by removing his right fielder in the sixth inning, yesterday at Fenway Park. Jackson trotted off the field, with Paul Blair taking his spot, and into a full-fledged controversy. 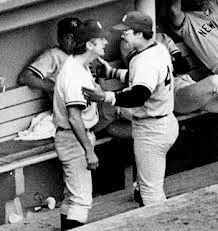 His exchange with Martin became so heated that coaches Elston Howard and Yogi Berra were called upon to restrain both men. The world doesn’t have to hate the Yankees anymore. They’re beginning to hate one another.